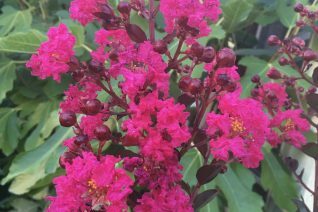 For sheer flower display and multiple other fine attributes we nominate Crape myrtles (Lagerstroemia) as one of our favorite trees. After all how many other trees come in so many distinct flower colors and along with bark and fall color each cultivar is different. Originally native to SW Asia they have been cultivated for 2000 or more years and their actual native range is now unknown. They have been cultivated in the United States since approximately 1737 when the first tree was planted in Charleston, South Carolina. 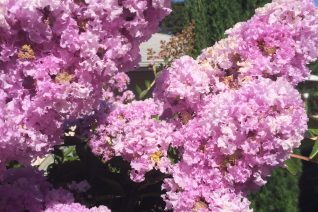 The first Crape Myrtles were brought from California to Oregon more than a century ago. Large venerable specimens can be found in the oldest parts of Portland, Salem, and Eugene. 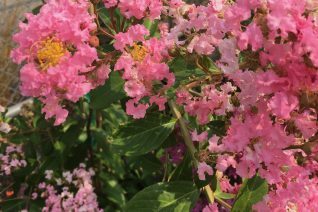 Our Crape myrtles have been selected after careful observation over the last 20+ years in our climate. All of these have been shown to bloom reliably in an average summer, are disease resistant, and completely cold tolerant. Again- each individual cultivar has different water as well as heat requirements to bloom. This is specifically mentioned in the text. Take a gander at our collection of these stellar small to large garden trees. 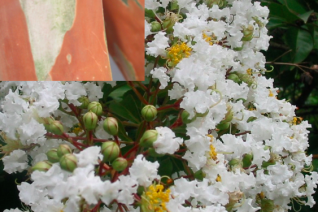 Crape myrtles aren’t just about flowers we actually are even more attracted to the handsome, exfoliating bark. This selection from the disease resistant Japanese species has some of the best bark in the vegetable kingdom. Swaths of muscular mahogany, cinnamon red smooth regions create a fantastic tapestry. 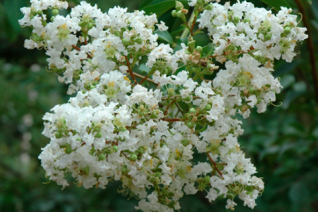 This is a very large growing Crape Myrtle with profuse but smaller trusses of FRAGRANT white flowers in mid- late summer. Fall color is bright orange/yellow/red and is very striking in its somewhat brief display. To 35′ tall in great age it grows approximately 3′-4′ per year when young. 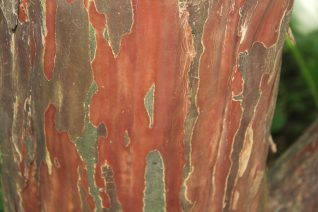 Bark begins to develop coloration in 2-3 years. Most often multi-trunked this gives the gardener even more beauty to stare at. Forms a spreading umbrella shape. Completely disease resistant. Best with consistent summer moisture for the first few years then only occasional deep soaks. Deciduous. A fantastic street tree with great dimensions and form. This selection – chosen for bark coloration can be difficult to locate. Beautiful tree. Striking crape myrtle with jet BLACK foliage that would be cool all by itself. The real kicker is intense true red flowers that smolder with the leaves. A naturally and reliably early blooming almost fastigiate tree. To 9′ tall but just 3′ wide in 7 years. Full hot sun and rich soil with regular summer irrigation for the best results. So far it has been completely mildew free as well. Imagine the late summer combinations? 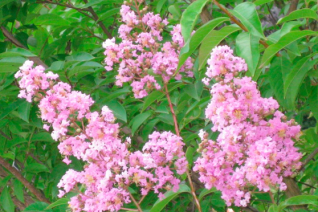 Blooms first appear in early August in urban areas- later in cooler hinterlands. If it never bloomed it would be a cool thing but that red. Wow. Fall color is non-existent. 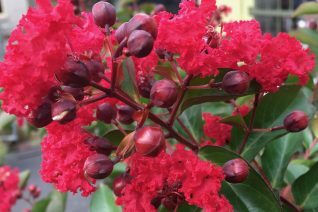 We discovered this seedling Crape Myrtle years ago in North Portland and we were amazed that it burst into bright red bloom beginning in July every year- despite all sorts of weather conditions. Upright growing dense tree to 10′ tall and 5′ wide in 10 years. 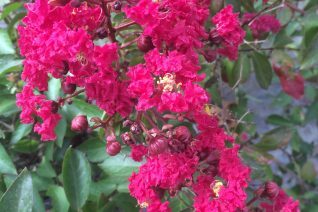 Large trusses of red flowers begin in July and peak in coverage on the tree in August. 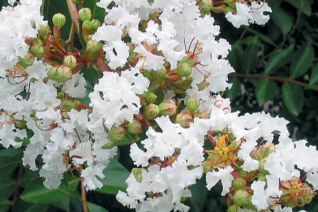 This crape myrtle must have regular irrigation to thrive/bloom and it favors richer soils than other cultivars. Water deeply once a week through its bloom period. In time the straight trunks exfoliate to glossy tan. Fall color is red/ orange. Moderately fast growing to 2′-3′ per year when young. Full hot sun and good air circulation. Avoid crowding with other plants. Pretty tree. Extraordinary small upright tree with new growth that is deep maroon slowly settling to green as the summer wears on. Reliable large trusses of shocking pink flowers typically appear by early August and then remains in bloom for 4-6 weeks. Very upright skinny habit to 10′ tall and just 3′ wide in 10 years in our climate. Full all day hot sun in a hot position. Grows approximately 2′-3′ a year when young. Extremely showy in bloom this eager bloomer makes a great small garden tree where rich soil and REGULAR IRRIGATION are present. Bark slowly exfoliates to a soft tan. Unauthorized propagation prohibited. Plant patent #10,319. Fall color is red/orange. Highly mildew resistant. 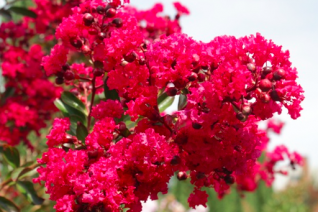 True red crape myrtles that actually bloom well in our climate are at a premium. This is one of those cultivars and we like it for several specific reasons. The flower trusses are true cherry red and huge and are held straight up. (Hence the rocket). Its best grown as a large multi-trunked tree to 20′ tall. The trunks begin to exfoliate after several years in place and show an amazing mottled deep chestnut brown and taupe display that is smooth and glossy. Unusual for both a pure indica and a red flowered cultivar . 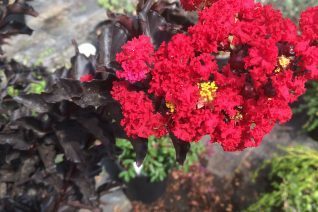 The medium green foliage takes on amazing orange/red tints in autumn before dropping and once they are off the tree- as with all Crape myrtles there is no raking. They simply dry up and almost instantly decompose. Neat and tidy. Full, hot, all day sun in a hot position in average soil with regular summer water. You must irrigate this tree deeply at least once every two weeks in summer so that it will bloom. The first flowers appear in August and extend to the beginning of October. Cold hardy and disease resistant tree. Unauthorized propagation prohibited. Plant patent #11,342. 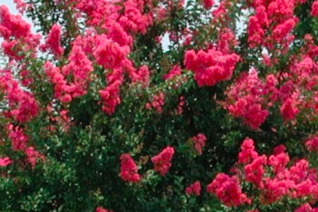 Large growing tree type Crape Myrtle to 20’+ tall with a wide spreading crown. Reliable soft, luminous purple large trusses of flowers begin on average the first week of August in the city and repeat bloom until October. Fast growing shade tree that can achieve 3′-5′ a year when young in optimal conditions. Free blooming tree that displays glossy, muscular tan trunks when the bark sheds in mid-summer. These contrast greatly with the deep green foliage and sumptuous purple blooms. Long lived, cold hardy, disease resistant cultivar that has shown its merits for many decades in the southern U.S. but less often grown in our region. Fall color is bright red/ orange/ yellow. Moderate disease resistance. Good air circulation- proper cultivation eliminates this threat. 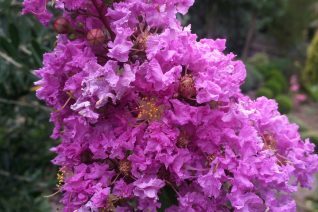 As with all purple flowered Crape myrtles the flowers can fade a bit after opening. 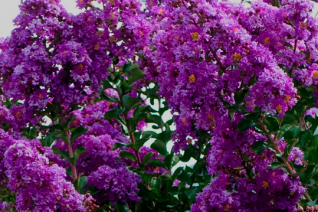 When a non-fading purple Crape myrtle becomes available we will be the first to let you know. Otherwise this is a great, dependable, garden tree. Deep, infrequent, summer irrigation. Six or more hours of hot sun per day. 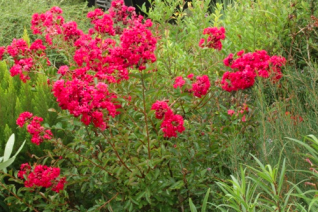 Smaller growing crape myrtle that we love for its opulent display of true red flowers in August to October. Slow growing to 8′ tall and 4′ wide in 8 years. Full hot sun and rich to average well drained soil with REGULAR deep summer irrigation to bloom. Loves heavy clay soils as long as they are irrigated. Fall color is red/orange and in time the stems exfoliate to glossy tan. Give this small tree/shrub the hottest site possible. Easy, disease resistant and cold hardy. Great for smaller gardens. 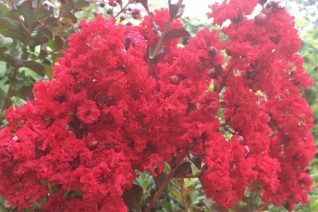 The largest triple hybrid from the National Arboretum has yielded an excellent true red flowered, disease resistant and reliable Crape Myrtle. Fast growing to 20′ tall but just 8′ wide it forms a very upright tree. The huge true red flower trusses begin in urban areas in late July and continue unabated for two months. New growth is maroon and still retains hints of that as it changes to green- giving this tree a darker look. We have found that it is slightly tender when young- freezes back in cold winters but it rebounds quickly in summer and established trees see no damage. Rich to average (including heavy clay) soils with regular deep summer irrigation for earlier and more prolific bloom. Bark is fair becoming a mottled patchwork of tan. Fall color is brilliant red. Fast growing- easily 3′-4′ per year in well irrigated trees. Mildew resistant. Full, hot sun in a hot position. One of the last National Arboretum releases in 2003 and a hybrid that includes three species. This extraordinary small tree is perhaps the best adapted to our milder summers. To just 9′ tall after 10 years this globose tree begins blooming in urban areas as early as the 4th of July and repeat blooms all the way though September. The enormous flower trusses are a vibrant magenta/ruby red. Very free blooming with perhaps the lowest heat requirement of any Crape Myrtle we have grown. In time the bark exfoliates to a smooth chocolate brown. Fall color is orange to red. Full, hot sun and rich soil with REGULAR irrigation (deep soaks at least once a week) until bloom. Brilliant bloomer with enormous trusses of vivid flowers. Excellent choice for cooler summer areas such as Puget Sound. Does not grow very fast as it is too busy blooming. Exceptionally disease resistant selection. Underused beautiful disease resistant Crape Myrtle that is free blooming with enormous pendulous trusses of pure white flowers. To 15′ tall with a somewhat weeping habit- especially in bloom. It creates a spreading crown on a small easy to grow tree for full, all day sun and regular summer water. The crystal white large flowers appear often as early as late July in hot summers and continues unabated to about the first of October. Fall color is yellow/orange and pretty. 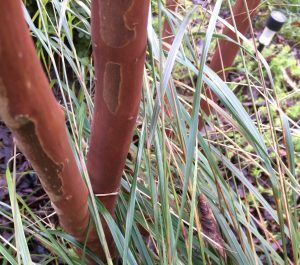 The sinuous trunks display taupe/beige glossy bark which is just as showy. Give this wide spreading small tree room to grow. Regular summer water and rich soil yields a growth rate approaching 3′ per year when young. As with almost all Crape trees it grows quickly to its ultimate size and then it slows considerably. Excellent garden tree. National arboretum selection. Obscure and exceptional tree type crape myrtle that was one of supreme breeder Donald Egolf’s favorite introductions from the National Arboretum. 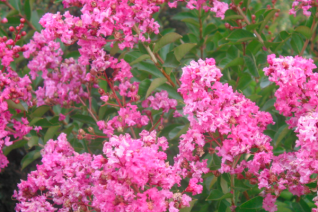 He introduced 30 Crape myrtles so thats saying a lot. Fast growing upright tree with phenomenal bark. Cinnamon red/mahogany/cream all are present on this 25′ tall arching tree. From late July to October a fantastic display of luminous soft pink flowers born on huge trusses. Fall color is vivid orange/yellow/red. In time it develops a spreading crown and makes a wonderful garden tree. Average to enriched soil with REGULAR summer water for the first few years. Deep soaks on established trees enhances bloom as well. Full, all day sun in a hot position. Excellent tree to garden with- roots are not intrusive and it happily accepts regular irrigation. Grows about 3′-5′ a year when young- slows down to its ultimate height. This is essentially an improved pink flowered form of ‘Natchez’. Limited quantities. For our climate this is one of the very finest summer blooming small trees. Forming a perfectly round dome in time to 12′ tall and nearly as wide this free blooming tree also requires the least amount of water to sustain it and bloom. 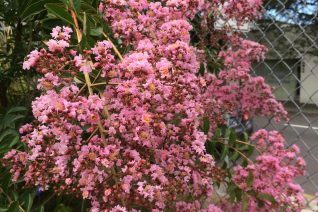 Beginning in mid-July large trusses of bubble gum pink flowers appear and they completely obscure the foliage of the crown re-blooming non-stop until the end of September. In fall reliable and incredibly showy orange to red and yellow fall color is stunning for an extended period of time. The bark sloughs off of older trees to reveal a glossy gray surface. Moderately fast growing this should be a standard landscape plant in our climate. Exceptional cold hardiness and no fear of disease. A deservedly popular tree in western Oregon for several reasons. Large globose panicles of clear pink flowers begin in urban areas as early as the beginning of July and repeat bloom until September. The open and vase shaped habit is graceful and bends gently under the weight of the huge flower trusses. In time this 15′ tree develops some of the best exfoliating bark of the genus. In late summer on trees older than 3 years the top layer of bark sloughs off revealing smooth, rich, chocolate brown trunks. Amazeballs. The bark is showy throughout winter. In autumn the foliage turns to shades of maroon and red. 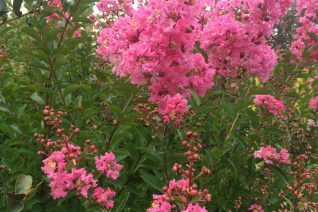 This crape myrtle MUST HAVE regular irrigation to grow and bloom. 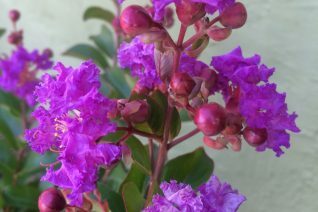 Excellent small garden tree with some of the lowest heat requirements to bloom. Water. You must water. National Arboretum release 1987, Spectacular tree in western Oregon. 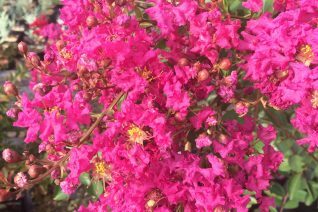 Sweet little tree that has some of the most vivid fuchsia/magenta flowers in the Crape Myrtle universe. To 14′ tall with a rounded crown. In late August to October huge trusses of vivid magenta flowers are quite showy. In the waning light of summer this vivid display is welcome. The trunks eventually exfoliate to a soft sandalwood brown with taupe blotches. Very nice. Completely disease resistant. Excellent small garden tree. Fall color is boisterous red and orange. Regular deep irrigation and full all day sun in a hot position. Grows approximately 2′-3′ per year when young. Excellent National Arboretum hybrid. 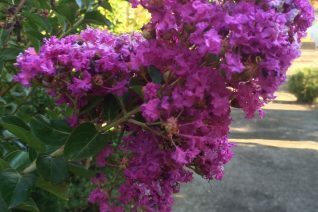 One of the most popular tree type Crape Myrtles and it is frequently planted as a street tree in the city of Portland. Strongly upright growing tree- almost fastigiate that eventually forms a spreading crown. The silhouette is that of a hot air balloon. Full sun and rich to average soil including clay soils. REGULAR summer water not only ensures a huge flower display in August and September it rapidly speeds the growth rate. Well irrigated trees can put on up to 4′ a year. Otherwise it makes due with little summer water by blooming much later- September. Extremely large hot coral pink trusses are held vertically. They can appear the size of a beehive. Less re-bloom than other trees. Fall color is orange/yellow/soft red and lingers. The exfoliating bark takes on a champagne pink glossy sheen when mature. Good garden tree. Excellent street tree. To 22′ tall and 8′ wide at maturity. Extraordinary tree that displays HUGE trusses of almost double flowered glowing lavender blue flowers. Open spreading habit on a compact tree to 14′ tall and 8′ wide. The branching structure favors the huge opulent flower clusters which always begin in my garden in early August and continues well into September. Fall color is a vivid orange and yellow combination and is reliable. The sinuous trunk displays pink/tan coloration Smooth and very pretty. Its consistently one of the youngest to show bark coloration. 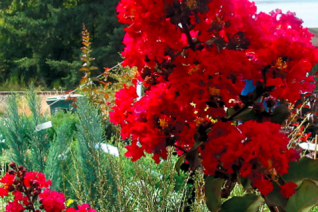 Full hot sun and regular summer irrigation to bloom and thrive. Very cold hardy and disease resistant. An easy and spectacular tree that should be planted everywhere. Beautiful. This has become a standard Crape myrtle in our climate. Excellent performance on a well scaled tree to just 17′ tall and very upright. Beginning on average in urban areas in late July large trusses of rosy lavender flowers appear in a huge display, it continues unabated for up to two months. The glossy green leaves turn to red/orange/yellow in autumn for a further display. In mature trees the bark exfoliates to a soft white/ gray- great contrast with the deep green foliage. Grows about 2′-4′ a year if well irrigated. Not fussy about soil just requires full all day sun and deep infrequent irrigation. Good air circulation. First rate small garden tree that is the size of many larger Japanese maples and pairs wonderfully with them in gardens. Very easy to grow tree. 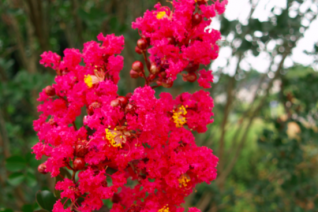 Well known as the queen of crape myrtles ‘Natchez’ is a magical tree with many different kinds of beauty. In mid-summer to October large trusses of pure white flowers bend twigs gracefully. Its bark is among the most striking of any tree. Swaths of cinnamon red and taupe mottled patterns envelope the trunk. In fall red to yellow fall color is showy for several weeks. To 22′ tall and half as wide in 10 years. Average soil that drains as well as regular summer irrigation both speeds growth and encourages blossoming. A striking specimen and useful as a street tree that will never become entangled in overhead wires. Completely disease resistant. Fall leaves drop and decompose almost instantly. Very nice- no raking. Fast growing in youth. Best with regular irrigation.